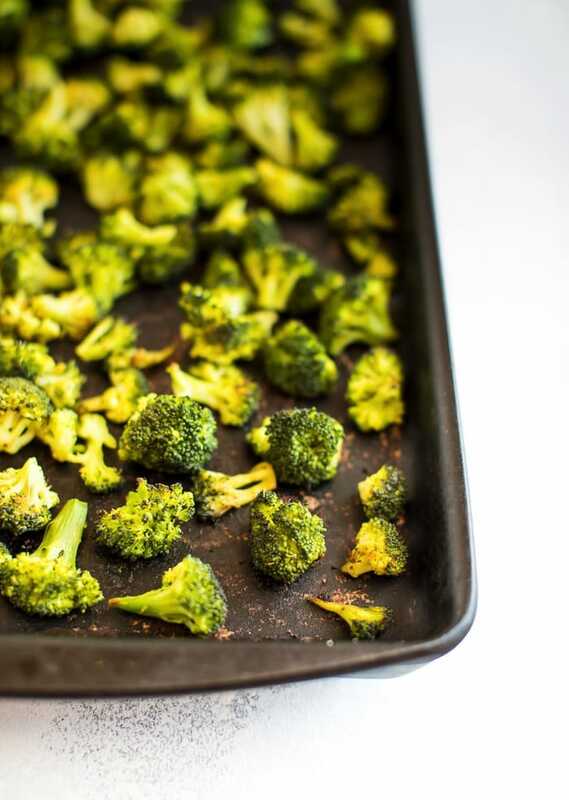 Yes, you CAN roast frozen broccoli — straight from the bag, no defrosting necessary. 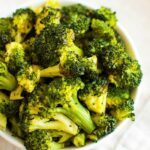 Trust me, this healthy cooking hack for roasted frozen broccoli will save you so much time and money! If you’re like me, you live for life hacks… especially in the kitchen. Anything that makes living a healthy life a little easier is a win in my book. I often buy pre-chopped veggies to save time in the kitchen (FYI: Trader Joe’s is an awesome spot for this! ), but until recently I sort of avoided buying frozen veggies because I would much rather eat roasted vegetables packed with flavor than soggy, steamed vegetables. Well, let me introduce you to my newest little cooking hack: roasted frozen broccoli. I don’t know why it took me so long to figure this little trick out, but a couple months ago I realized that you can roast frozen broccoli and my world was changed. Of course the texture isn’t exactly the same as roasting fresh broccoli florets, but the frozen broccoli florets still get a little crispy and I honestly don’t mind that the texture is a bit softer — especially when you consider the fact that there is almost no prep work at all. I mean all you have to do is preheat your oven, dump the bag of frozen broccoli on a pan, add a little oil (you can use spray oil for this) and some seasonings, and you’re ready to roast. If that doesn’t make your day, I don’t know what will. Kidding! 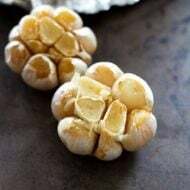 They are frozen when they’re at their peak freshness, so they’re packed with nutrients. Since they’re frozen, you don’t have to stress about eating them within X days of buying. And you can keep a few bags in your freezer for emergencies. So far I’ve tried this roasted frozen veggie hack with broccoli and cauliflower and it works great with both, but for whatever reason I think the roasted frozen broccoli is better, probably because it crisps up a bit more. I’m not complaining because we all need more green veggies in our lives, right? Feel free to have fun with this recipe and try it with different vegetables, a different oil/fat, different spices — the options are really endless. For the seasonings you can keep it uber simple with a few liberal shakes of sea salt and pepper, which is what I usually do, or get fancy and add on some additional spices like garlic powder, onion powder, curry and/or cayenne. Obviously you don’t have to use all of these. Just pick your favs. 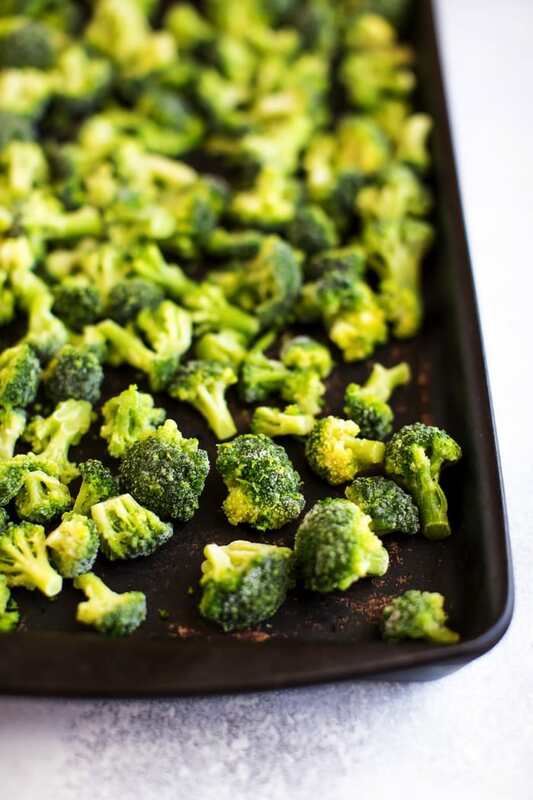 Yes, you CAN roast frozen broccoli — straight from the bag, no defrosting necessary. 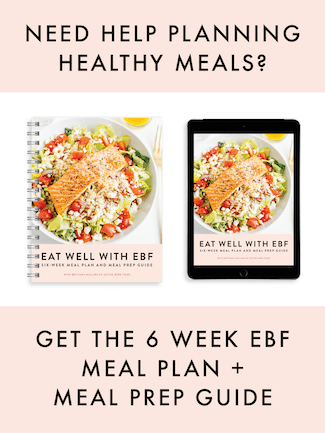 Trust me, this healthy cooking hack will save you so much time and money! Preheat oven to 400°F. 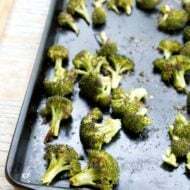 Empty bag of frozen broccoli florets onto a baking sheet or stone. If you’re using a baking sheet you can line it with parchment for easy clean-up. 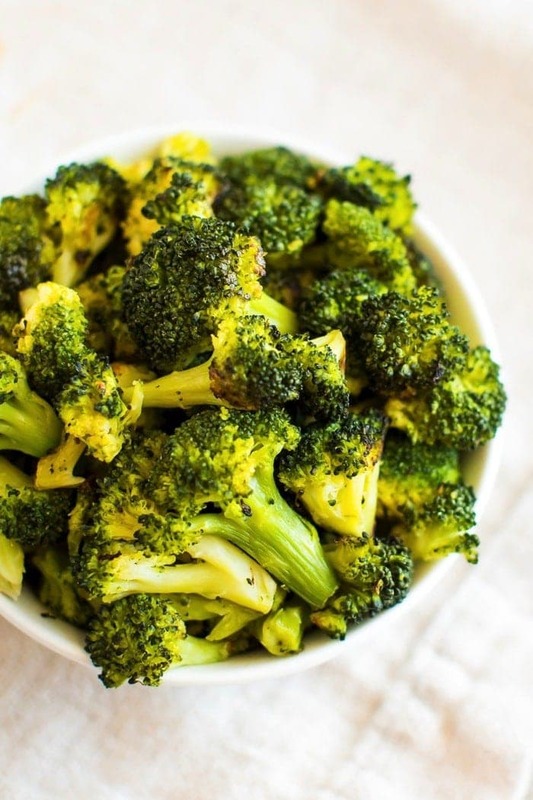 Drizzle oil over broccoli, add seasonings and toss to combine. 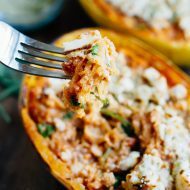 Place in preheated oven and roast for 25-30 minutes, tossing once at the 15-minute mark. Remove from oven and serve warm. Be sure to get the frozen florets. Frozen chopped broccoli includes the stems, which is fine if that’s what you like, but I prefer the florets. I want to hear from you! Do you have any heathy cooking hacks? Have you ever roasted frozen vegetables? Definitely let me know if you try this roasted frozen broccoli hack. I hope you love it as much as we do. I never roast the frozen broccoli. But the way you demonstrate it makes me give a try on this healthy one. The pepper and olive oil is not enough to give a good taste, I guess. Everyone got a different taste though. 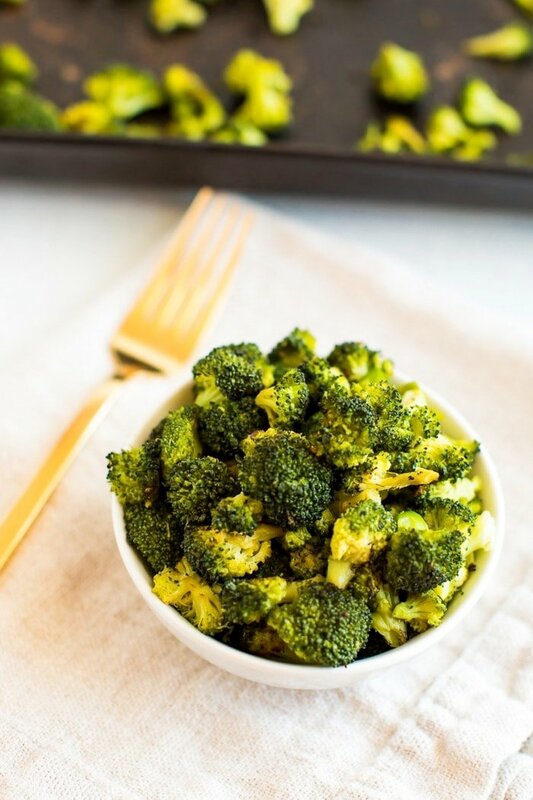 I wanna try this healthy roasted broccoli with onion and garlic powder. Anyway, thank for this recipe, Brittany. Keep up the good work. Is not good. But vegetables are ok. How can I fermented them? Also can you provide a receipie for salad dressing that has no fat at all. Thanks so much. Oh my goodness, I am so glad you tried this! 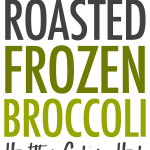 I had no idea you could roast frozen broccoli. I’m definitely going to do this from now on. I just assumed they would end up a soggy mess – but obviously not. With kids I always like to keep bags of veg in the freezer as a back up plan. My best-laid plans of starting to cook dinner early are often delayed so frozen veg is the best because it saves me time. And if I can roast, even better. I can’t wait to give this a try in my Air Fryer. It saves me the time and energy of heating up the oven. Thanks for sharing. This has honestly changed my life. I’ve already consumed more broccoli in the past week than I have for months. Broccoli is never my veggie of choice but I bought two large bags from Trader Joe’s and they crisp up perfectly!! Also perfectly timed with another article I read that frozen vegetables (and fruit) may actually have more nutrients than the fresh stuff due to being frozen at peak freshness. Thank you for the tip! Just a tip for everyone, it helps if your veggies crisp up even more if you throw some olive oil on your baking sheet and let it heat up BEFORE you add your veggies. Do that for about ten minutes and you’re good to go! I also used salt free Mrs’Dash to season. Came out great. Ohh! I love this tip, Brittney. Thanks so much for sharing. Didn’t know. Mind blown. Worth.